Last week I posted about the trials and tribulations of dealing with a partner suffering from “man flu”. By the weekend it became clear that FFOMC’s symptoms where a lot more serious than initial observation suggested. He was in a bit of a bad way and at one point it looked like he may not even make it into work – I cannot stress enough how rare it is for him to need time off. I wish to offer a sincere and full public apology for doubting him in his time of need and withholding much needed sympathy for my bed ridden partner. You will be relieved to know that he is now fully recovered and back to his normal self. After a very successful open evening I returned home at the unreasonably late time of 9:30pm to discover FFOMC flat on his back on the sofa, nose streaming, eyes puffy and showing all the symptoms of man flu. As any woman who has ever had to put up with this condition will know – the symptoms go way beyond a sniffle, temperature and slightly raised temperature. 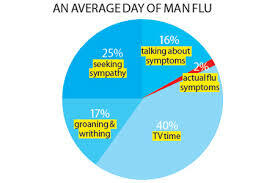 In fact according to the great little chart I discovered online, only 2% of the time spent by the sufferer are devoted to experiencing flu like symptoms. A further 17% of the time spent suffering this condition is devoted to the incessant groaning and writhing of a man suffering. This is an important element as it guarantees that the woman in said man’s life will not have a moment when she can forget that her beloved is feeling poorly. Of course any acknowledgement by the woman of the groaning and writhing will lead naturally to the16% of a typical man flu when the man immerses himself in the process of describing the symptoms in detail, down to colour and consistency of mucus, scratchiness of the throat and suggestions of the favoured brand of ice cream that is believed may help alleviate the symptoms. Now that the woman is fully in the picture of the gravity of the situation and the high risk of an early demise that accompanies the condition she is of course obliged to address the 25% of the man’s time demanding sympathy. As FFOMC has sadly had man flu before and I have had an extremely long day at school resulting in a lower tolerance threshold than usual, I am going to bed enabling him to treat his ailment by taking up residence in front of the TV. 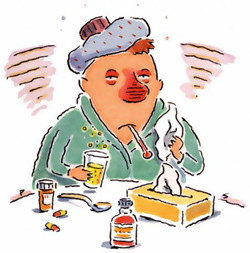 Good night all – I wish you good health and the absence of man flu in your own homes – but beware, I understand it is VERY CONTAGIOUS.